Ready for the first Spanish tiara ever on Tiara Thursdays? You should be, it's pretty. 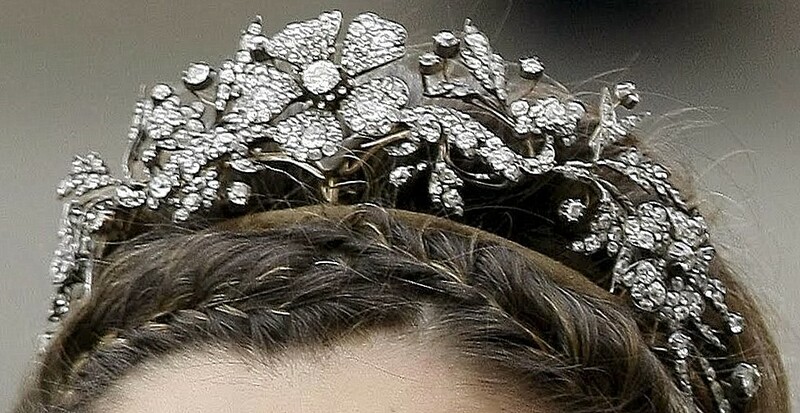 This tiara was originally often said to have been a piece by the French jeweler Mellerio, and is often referred to (and has been called in the past on this site) the Mellerio Floral Tiara. General Franco gave the tiara to Princess Sophia of Greece and Denmark on the occasion of her marriage to Juan Carlos of Spain in 1962 on behalf of the Spanish people. 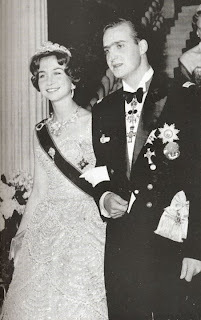 Franco would eventually name Juan Carlos as his successor and the monarchy would be restored on his death in 1975. The association with Franco caused a bit of a stir (suddenly, though it had been out there for years) when Princess Letizia wore the tiara to a dinner in the Netherlands in 2013. 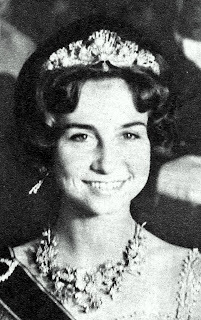 The stir prompted the royal house to clarify the tiara's origins, explaining that it had in fact been commissioned by Alfonso XII from British jewelers J.P. Collins in 1879 as a wedding present for his second wife, Maria Christina of Austria. The piece left the family and was later acquired by Madrid jeweler Aldao, where it was bought by Franco for Sophia. This diamond tiara set in gold and silver in a floral motif is actually convertible: it can be a necklace and the center flower can be a brooch. Sofia (switching now to the regular Spanish spelling of her name, rather than the Greek Sophia) wore it as a necklace for her pre-wedding ball, and I'm not sure she's ever worn it as such again. You know, I think she really doesn't have time to play around with the convertible properties of this piece; it's kept in fairly constant use as a tiara. The Spanish collection of tiaras is not exactly small but it isn't overflowing with tiara riches either, so the ladies do a lot of sharing. This seems to be the most shared piece in the family. If there's a tiara event at which all of the Spanish royal ladies are present, it's nearly a guarantee that this one will be making an appearance. Infanta Elena borrowed it mostly in her younger years; these days, she usually wears the tiara she received as a wedding gift from her (now ex-) husband's family. Diamond floral tiaras are pretty common, but I think this one is a definite contender for the best floral tiara prize. It's delicate, but it's a great size and has good dimension. It looks good on a whole range of face shapes and hairstyles. Plus, it's convertible (which is awesome, even if you don't ever convert it). Where does this rank on your list of favorite floral tiaras?